Interviewed by the Iranian TV, September 17th, 2008, His Excellency President Bashar Al-Assad said: “The Syrian Iranian relations are very strong and solid. The strategic relations binding Syria and Iran have not been created through the agreement following the Iranian Revolution between President Hafez Al-Assad- may his soul rest in peace- and Imam Khomeini; these relations have been established as a result for objective things and in accumulations for these relations leading to the establishment of the standing strategic relation between both countries. The Revolution in Iran announced at the outset its stand by the Palestinian Cause, contrary to the Iranian previous stance, which had strong relations with Israel; a stance perhaps closer to the Israelis more than to the Arabs, the natural neighbors for Iran,” citing the increasingly joint ventures, oil projects and would be market between Syria and Iran, recalling, further, the Syrian stance by Iran during the unjust war of eight years against it. “Iran has always supported the Palestinian Cause, Arab Right, and the Syrian Rights; has stood against the Israeli aggressions against the Palestinians, Lebanese and against the Syrians,” added President Al-Assad pointing out to the independence of decision- taking by both Syria and Iran, based on the interest and principles, as member states of the Islamic Nation; reiterating “We do not belong to those states which build temporary, transitional or circumstantial relations. We do have our principles, and interests; thus the factors binding Syria and Iran are increased and more solid day by day,” reiterating the would be ever strategic partnership between Syria and Iran notwithstanding whatever schemes or pressures. “We have to be the makers of our future and by our own hands,” underlined His Excellency the President, citing the importance of the standing multifaceted cooperation and coordination among Syria, Turkey and Iran, voicing the hope to expand it to include other countries like Iraq, for example; citing, further, the partnership with Venezuela , and Malaysia as far as joint ventures with Syria. “The Syrian –Iranian strategic relationship has proved its importance for the region during the past decades. The real results have appeared during the recent decade; that is the victory of the Resistance in Lebanon and the steadfastness of the Resistance in Palestine following the Intifada, which began in the year 2000. The real results have also appeared through the foiling of the underway schemes or those planned since the 80’s, under implementation now for our region. Of course, the schemes were not fully foiled but partially so; had it not been for the strategic cooperation among us, Syria and Iran, the conditions in the region would have been worst.” outlined His Excellency President Bashar Al-Assad citing the continued failure of such schemes and plots. President Al-Assad underlined the need for the bolstering of the Arab-Iranian relations citing, as example, the big reciprocal and joint contributions of the Arabs, Turks, and Persians to the past Umayyad State, Ottoman as well as Persian Empires. In reply to a question regarding the European role, His Excellency President Al-Assad cited the ongoing efforts exerted by President Nicolas Sarkozy of France as to restore the French role, saying: “ We are interested in having the beginning for divergence between the European role and the US role, such as what we are observing as far as the dealing with presented issues; we want to see a European official telling us that we have the right to restore our land fully…” expressing the view that we, however, do not expect the West to be closer to Arabs more than to Israel. Regarding the so-called Nuclear file of Iran, His Excellency President Al-Assad said: “ The Syrian stance stems from the necessity of freeing the Middle East from Mass Destruction Weapons; this means that Israel should not possess nuclear bomb; hence it is the only state in the Middle East that has nuclear bomb; Israel itself has initiated such a kind of a race,” pointing out that the NPT – Non-Proliferation Treaty- grants the right for any country in the world to possess a peaceful nuclear reactor, including the right to the enrichment of the necessary materials to get the necessary fuel to operate reactors, citing, further, the Iranian collaboration with the International Atomic Energy Agency. 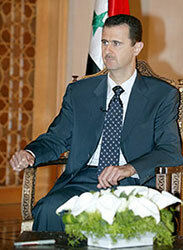 In reply t a question regarding ‘cold war’, His Excellency President Al-Assad said: “We have no interest in a cold war. Our interest is the presence of an international balance; we have suffered the consequences of a one-poled presence, represented by the USA; Russia now suffers and even Western Europe, an ally of the USA, has suffered the presence of this one-pole, and has lost in many posts of the world. The entire world, or the most of the world, has the interest of having two poles,” expressing the belief that the cold war was imposed by the United States and its allies, and never ever by Russia following the developments with Georgia. Regarding the indirect peace negotiations between Syria and Israel with the mediation of Turkey, His Excellency President Al-Assad said: “ I would like to make it clear that what is taking place now is not negotiations with the full meaning of negotiations; it is similar to what happened before Madrid Conference in 1991; when the then US Secretary of State, James Baker, shuttled between Syria and Israel as to lay down the bases for the direct negotiations launched in Madrid Conference,” noting that that past experience with the Israelis during the 90’s peace negotiations, and the many massacres perpetrated, not to mention the continued killings, aggressions against Syria and Lebanon, and threats against Iran, deem it necessary to wait and see whether the Israelis would prove the opposite of the said, and would withdraw from the occupied territories, as to trust them.